Monday, September 10th, Free Session for Beginners, 6:30 to 7:30 p.m., 362 East Mall. There will be no Winter 2019 session. Monday April 1st , Free Session for Beginners, 6:30 to 7:30 p.m., 362 East Mall. Monday, July 8th , Free Session for Beginners, 6:30 to 7:30 p.m., 362 East Mall. 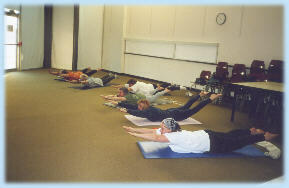 Types of Sessions: Classes will take into consideration the individual health needs of students. Semi-Private and Private Sessions can be arranged at student’s time preference. Day-time and evening classes throughout the week including Saturdays. Please contact to arrange your time preference. Competitive rates with quality service. Fees must be paid on day of service by cash or cheque. Missed classes must be made up during the same term of enrollment. With a Term Pass, minimum 24 hours notice is required to cancel a class, otherwise, a cancellation fee of half the full cost of class will be charged to clients. A Wellness Gift Certificate is most welcomed by the recipient for any occasion. Apart from expressing personal sentiment, it offers experiences of better health and wellness. Consider giving a Gift Certificate to your family, friends and associates. We invite you to offer an Individual and/or a Corporate Gift Certificate, available in denominations of your choice, e.g. Single Session, Term Pass or a Customized Pass. For details and more information about Gift Certificates, please contact Perin at Yoga Vitality Studio. We will be glad to prepare a customized Gift Certificate to suit your needs.